Caribbean is probably better known for its larger boats, but there are plenty who remember their 21ft Reef Runner as the best all round trailer boat of its time. 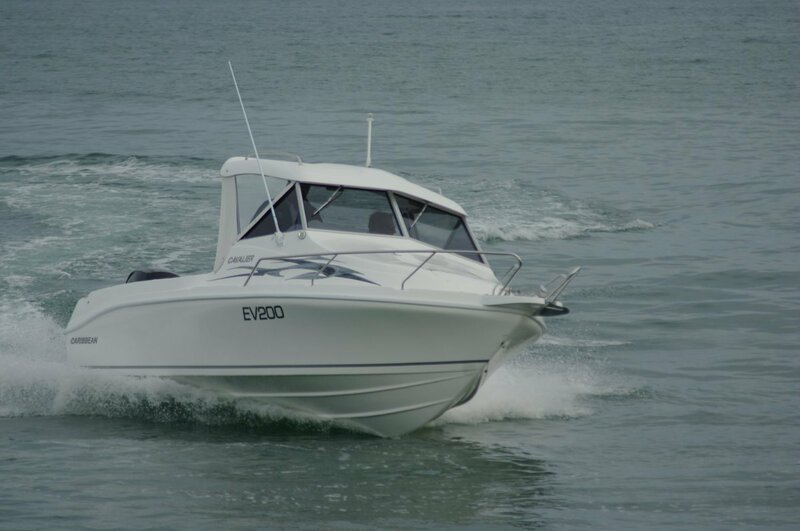 Caribbean has never stopped developing a trailable range, and the 20ft Cavalier Mk 2 is one of the current craft that builds on the Reef Runner’s legacy. It is very much a contemporary vessel. The Cavalier has been laid out for maximum daytime space. There is no bulkhead to the cabin’s rear, although a canvas one is optional, making a huge increase in the apparent and useable area of boat. This still leaves enough length in the cabin for full length bunks, which have easy access for use as settees if sheltering from rain. This is clearly a boat built with fishing in mind, and space is a part of that. There are only two permanent seats, excellent swivels on locker boxes at the dash. There are two other seats in the quarters alongside the motor well, but these lift out when things get dinkum allowing angler access to all parts of the cockpit. A small but thoroughly practical refinement is in the side pockets. Traditionally in fibreglass boats these are fragile, vinyl coated things that owners constantly remind you not to use as steps. Here they are tough, moulded items that positively welcome the tramp of feet. A couple of other refinements are the side grab rails and the fuel filler. The grabs are more often now seen recessed into the coamings, but it is always a welcome sight when they are. Thoughtful placement of the fuel filler is less common. The Cavalier’s is within the outboard well where overfilling will result in spills neither into the boat nor necessarily into the environment. The Cavalier’s hardtop is closed in the sense that it meets the windscreen’s top. It needs only the provided small segments of clears at the sides to do a thorough job of protecting the two in the first class seats. If you can’t look over the top of your windscreen you really need wipers and are so often not given them. Not so here, where both sections of armour glass get their own wiper. The hardtop is double skinned allowing the radios to be housed up there, but its weight does nothing damaging to the boat’s stability. Traverse a side deck, using the well located grab rails, and there is little reaction despite the sharp 19 degree deadrise. The very large fore hatch removes the need to make the journey anyway. It puts the lidded anchor well within the easiest of reaches of someone standing in the cabin. No one ever complained that a boat had too many places to put things, but Caribbean has done its best to sate anyone’s appetite for storage. As well as the seat lockers and carper lined side pockets, including a second storey of them near the seats, more lockers are provided below the deck and under those long bunks. A pair of top loading transom lockers complete the fit out. Caribbeans spend longer curing in the mould than do most boats, with almost the entire structure assembled before their removal. The result is near perfect reproduction, which should mean a little more speed, slightly straighter tracking. I was not able to measure this – I don’t know who could – but steering was a pretty much hands off affair. And when the hands did go on it was no effort thanks to the hydraulic steering. The basic motor recommended is 115hp, which the agents provide with twin batteries as standard – a very good standard. This would probably deliver the performance most owners could ask for as the motor fitted, a 150hp Mercury four-stroke, delivered 40 knots flat out. With the 115 in place the dry trailing weight drops under 1500kg, which could be a significant figure for the towing vehicle.